I want to start this post by thanking all of my wonderful friends and family who have extended a great deal of grace to me over the last fifteen or so months as I've prepared for, experienced, and then dealt with the aftermath/healing process of losing Evie. At times I've needed hugs, space, words, silence, company, solitude - thank you for being gracious and loving me in all of it. You are all wonderful people. But I'm not the only one who has experienced this sort of tragedy. I'm not the only one who needs grace. So here are a few thoughts on how to extend grace and love toward other mommies who have experienced the loss of a precious little life. So today, more than any other day, I want anyone who finds themselves on my blog to be aware and find the silence broken on two main things: pregnancy and infant loss happens and it hurts. And I want those two facts to change the way people react to it now and forever. 1. It happens. Tragically, pregnancies and infants can be lost. And these losses know no racial, socioeconomic, or other demographic bounds. It is a tragedy that can and does reach people from all walks of life. And there is rarely anything these sweet mamas could have done to prevent it. Miscarriages, stillbirths ... the majority of the time there is no medical explanation. And, in cases like my Evie-girl, there is no hereditary reason either. In a world where statistics are normally on your side, sometimes they just aren't. And it can result in some pretty painful losses. 2. It hurts. There is a quote I've seen on Pinterest that reads: She wasn't just expecting a baby. She was expecting the rest of their lives. And that, my friends, is why losing a baby at any point during pregnancy or shortly thereafter is so unbelievably painful. As soon as two lines are visible on the pregnancy test, we mamas start planning. Before we've even walked out of the bathroom we have nurseries decorated, a list of names, both first and middle, for both a boy and a girl, and we have already begun to dream - of that beautiful face, of that kitten-cry, of the way our lives will be miraculously changed forever. And anything that results in us not being able to see, hear, or experience those treasures is painful. So. Incredibly. Painful. 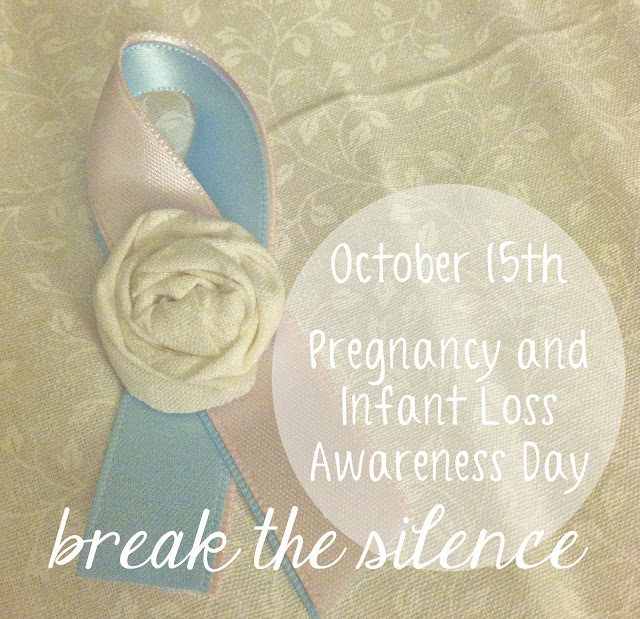 Pregnancy and infant losses happens and it hurts. So what can you do? 3. Let this new knowledge change the way you react to situations like this from here on out. When you hear of a friend having an early miscarriage don't say, "Oh well at least you weren't farther along." Instead say, "I am so sorry for your loss. I know how excited you were. Please let me know if there's anything I can do for you." And then send her a genuinely thoughtful and caring note in the mail with a gift card to Starbucks enclosed. And drop a meal off at her doorstep. When you hear of a friend losing her precious little one at 18 weeks and having to labor to bring his or her lifeless body into the world don't say, "Well, it's probably better. The baby would have likely had a lot of problems. Better that it didn't really have to suffer." Instead, say, "I cannot imagine going through what you did. You are so brave and such a wonderful mother to do that for your child. If you ever want to share, I would love to hear all about your labor and see pictures of your precious baby. Please let me know if I can do anything for you." And then send her a genuinely thoughtful and caring note in the mail with a gift card to Starbucks enclosed. And drop a meal off at her doorstep. When you hear of a friend finding out that her unborn child will likely not survive after birth, don't avoid her, or talking about her pregnancy, or touching her belly, or pretending like her world isn't crashing down around her. Instead, say, "I don't know how you get out of bed each morning. You are wonderfully resilient and I admire your courage. Your baby is precious and lucky to have you as his or her mama. Please let me know if there is anything I can do for you." And then send her a genuinely thoughtful and caring note in the mail with a gift card to Starbucks enclosed. And drop a meal off at her doorstep. When you hear of a friend learning the shocking news that her full-term, otherwise healthy baby will now be delivered stillborn, don't leave the subject unaddressed. Instead, say, "Oh my word. I am so shocked and completely heartbroken for you. I have no words except to say I am here for you. Please let me know if there is anything I can do." And, next time you see her, embrace her wholeheartedly and let her cry. And cry with her. And let her talk about that sweet baby. And then send her a genuinely thoughtful and caring note in the mail with a gift card to Starbucks enclosed. And drop a meal off at her doorstep. And sometime after your friend's loss, when she seems fine and like her life has resumed as normal, don't be so ignorant as to say, "Oh, she's fine. She probably doesn't want to talk about it. And maybe she's forgotten." Instead, pull her aside and say, "You look amazing and are living life so unbelievably well after your loss. I'm so proud of you. But I'm sure it still hurts. I see the pain in your eyes when you are around other babies. I'm so sorry. Please know I haven't forgotten what you've been through. You and your baby are so precious to me. I love you both very much. Please let me know if there is anything I can do for you." And then take her out for coffee and let her cry and talk about her baby and her experience. Because, chances are, she hasn't felt free to do so in quite some time. And, even still, send her a genuinely thoughtful and caring note in the mail with a gift card to Starbucks (or somewhere else, since you did just have coffee with her) enclosed. And drop a meal off at her doorstep. These are all suggestions. They might not work for everyone or speak to every hurting mommy the same. If you're wondering how to truly help a friend, don't be afraid to simply ask her what she needs. Trying to do my part today in breaking the silence surrounding pregnancy and infant loss. But, above all, trying to raise awareness about the grace these mamas need to experience from loved ones to help them through this trial. Wonderful post Sarah. The repetition at the end of each section made me smile (such good advice!) and the paragraph about when the mum appears to do better brought tears to my eyes. It always means a lot to me when someone says they are proud of me for how I'm going, but sometimes I wish more people than just my husband recognised (and acted upon) that I can be uncomfortable around babies. I agree with you. Anytime we lose something we thought we had it's painful and we grieve. Especially when that something involves our babies. Your words are so true. I love every single thing you wrote here. You are so wonderful at loving. I'm thankful you're my friend. I love you! Wonderful words to share Sarah. Thank you and sending a big hug today! Oh Sarah, I want to learn to love those who have lost even better. Thank you for sharing this. Love you. Thank you. I posted about pregnancy and infant loss awareness and my own two miscarriages today on facebook and not ONE person responded. I have a beautiful son who fills my world with joy every day and I am expecting another but my heart aches still so badly for the two babies I lost to heaven. Thank you. Is it too late for me to say I'm sorry for those precious lives you lost? I'm sorry you don't have three children to play with every day and three children to rub your belly in eager anticipation of meeting their newest sibling. I'm very sorry ... I know it hurts so much. If you ever feel like you want to say more about your babies, please feel free to email me: sarahjrieke@gmail.com. i came over from laurens blog...thank you so much for writing this. my heart needed it tonight. Beautifully said. Thanks for sharing this post! Thank you so much for sharing this. After four miscarriages, a lost referral and returning our sweet girl to her birth mother in a situation that is far from ideal, my heart feels fragile, tired and forgotten. Thank you for reminding me that us momma's with more babies in our hearts than holding our hands are loved. It's been almost 50 years since I lost my first baby, and my miscarriage was soon followed by a healthy baby. Still, from time to time, I think about what could have been, and being grateful that he will recognize me as his momma when I meet him in Heaven some day. Thankful to my friend, Heather, who posted this. Now, I can comfort her. The day you wrote this is the day my doctor could not find a heart beat for my little angel. It was confirmed on the 16th that we had lost our baby girl. I delivered her on the 21st at 24 weeks. She was so tiny and so perfect. Since than I have found this amazing community of women full of strength and support. I so appreciate all that you do to break the silence and I hope to be able to help with that. Thank you so much.